Gaming and entertainment are clearly the go-to applications that most people think of for virtual reality, but there’s also a massive opportunity for the immersive experiences delivered by VR to transform aspects of everyday business and to tie into existing technologies like digital signage. According to a press release from IDC, the global VR market is forecasted to be worth $162 billion by 2020, with VR having the potential to help sell products, train staff and hire new people, prototype new innovations, troubleshoot problems and undoubtedly do a lot more. While this is very different technology than what pro-AV integrators typically sell and service, at its root, VR is a one-to-one, interactive experience. To share the experience, and sell it, a lot of VR technology can replicate what a person would see on a multi-display configuration or setup. Not only can it provide the same information businesses would produce on a display, but VR can help set the ambiance of a location — helping customers determine whether it’s feasible to visit or not. 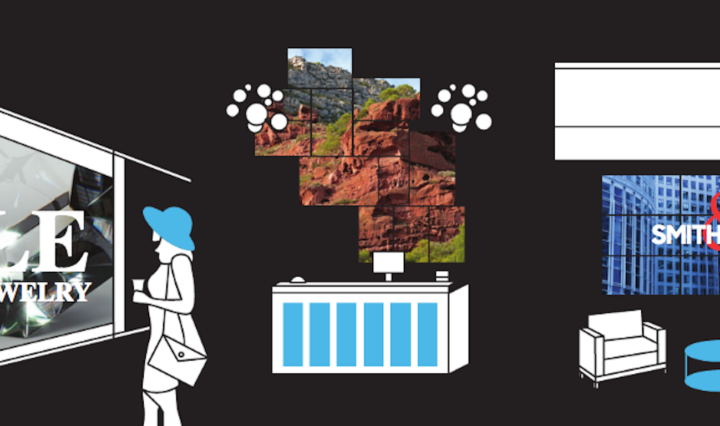 Explore the possibilities of videowall technology in this infographic. Take the business use case for example. Talking customers into the time and expenses associated with facility tours that may close a deal is rarely easy — especially if the location is off the beaten track. But what if virtual reality headsets with 360-degree, real-time views could take potential clients to that facility, let them see what goes on and talk to the people who do the work? And what if it could be pulled off from a remote meeting room or office, demand zero travel and take no more than 30-60 minutes? It would be amazing — and it’s entirely possible already — to create that sort of immersive experience that transports people to different places simply by putting on headsets like the Samsung Gear VR. Systems integrators walking through the exhibit halls of this year’s InfoComm pro-AV trade show on June 14-16 in Orlando, Florida will see a new area dedicated to virtual reality, augmented reality and mixed reality hardware and applications. This glimpse into the future of virtual reality will focus on how companies that are already providing audiovisual solutions for businesses, schools, government bodies and even houses of worship can branch into this new, rapidly evolving area. InfoComm’s Immersive Technologies pavilion in Hall A will feature technologies such as 360-degree live-streaming cameras capable of fully immersing people into a facility or event. There are numerous manufacturers marketing VR cameras for the consumer and professional markets, and one of the business-oriented products getting a lot of buzz is the Samsung 3D 360 product. This spherical device has 16 cameras on its edges and another up top, making for what’s touted as the world’s first true real-time omniview 3D camera. It can livestream 360-degree video. The production hardware is now getting software feedback from a test community, says Samsung’s Josh Dixon, senior product manager for VR. “We want to hit the market with the right feature set, the right price point and then launch running,” Dixon told 360 VR this spring. Visualization and Design: Architects and product designers are immersing clients in photo-realistic designs of retail spaces and offices to help understand sightlines, positioning and even the fit and finish. Simulation and Training: Specialized military units, first responders, maintenance crews and even high-performance athletes are doing advanced training, seeing equipment from all angles before they get on site, or visualizing a potential situation long before they’re placed into it. Education and Medical: Surgical teams are rehearsing delicate, incredibly complicated procedures in VR before patients ever get wheeled into operating theaters. VR is enabling surgical residents to see the “rock stars” of their profession work and teach, without being in the room. VR can also help create an immersive experience for students in traditional classroom settings. While the previous generation of students learned from books and videos, today’s schoolchildren are being virtually transported to rain forests and volcano rims. The potential is enormous, and for integrators, it’s a logical extension to the visual systems products and services customers already buy from them. Putting on those headsets may look like fun and games, but the future of virtual reality is ready for business. Learn how the future of virtual reality can also help the government tackle public health issues.